An example of a Fiat Scudo upfitted with floor panel, wall paneling and a kit with shelving and drawer units. The Van Kit Plus packages have been designed by the Syncro System technical team to create efficient solutions for every type of van upfit. 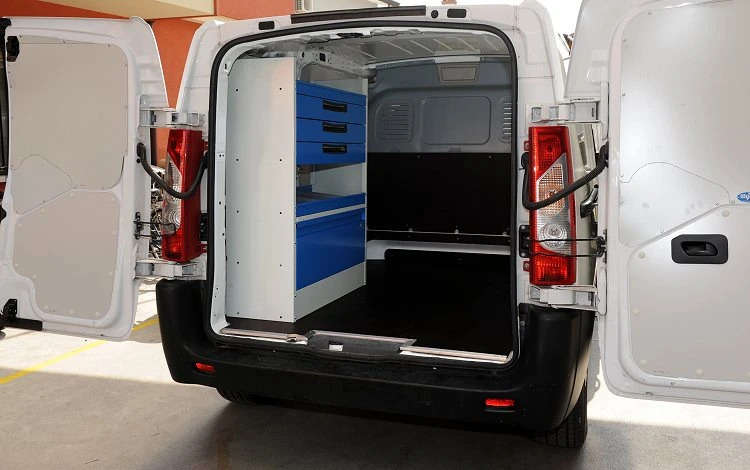 The Van Kit Plus is a practical solution: lightweight, quick to install, affordable, yet still giving you plenty of room for personalization. 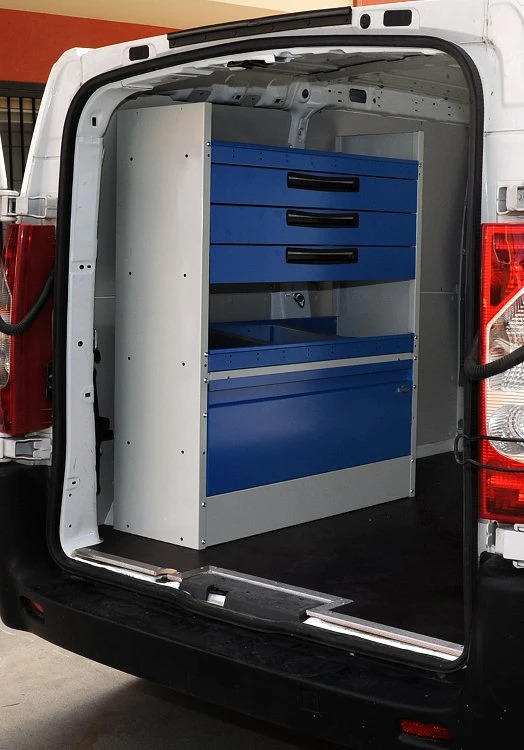 The extensive Syncro System catalog offers an infinite combination of possible upfits, while the Van Kit Plus gives you a package with our most requested products: wheel arch frames, and shelving and drawer units that meet the everyday needs of many working vans. Because the individual elements of the kits retain Syncro standard measurements, they can be mixed and matched with all other Syncro components and accessories. The photos on this page show a straightforward yet incredibly practical upfit for this Fiat Scudo. To protect the cargo floor from being damaged by transported materials, we first installed a resin-coated plywood floor panel, complete with stainless steel borders and recessed anchorage points. The floorboard also provides a sturdy base to mount the racking units and components. The bulkhead is also protected by a 12 mm plywood panel – the same wood used for the floor panel. On the interior walls, we mounted laser-cut, pre-coated galvanized steel paneling. The paneling was also mounted to the upper part of the rear doors. Moving on to the crux of the upfit, we see the Van Kit Plus: a wheel arch frame with closing hinged front doors, two shelves and three drawers. Both the shelves and the drawers come complete with non-slip rubber mats and two aluminum dividers. The doors are gas activated, and the drawers are equipped with telescoping ball bearing slides and an automatic locking system with double side blocking. Syncro System quality and durability in a simple, fast and lightweight kit! HERE’S SYNCRO’S FIRST EVER VAN RACKING SYSTEM, INSTALLED 23 YEARS AGO! ALL SYNCRO STRAPS ARE CERTIFIED! SYNCRO EQUIPMENT IS ALMOST INDESTRUCTIBLE! SYNCRO SYSTEM HELPS YOU TO COMPLY WITH THE LAW ON SAFE CARGO RETENTION!